Personnel from the Fire/EMS Department Office of the Fire Marshal have determined a 3-alarm fire in New Carrollton to be “incendiary”. 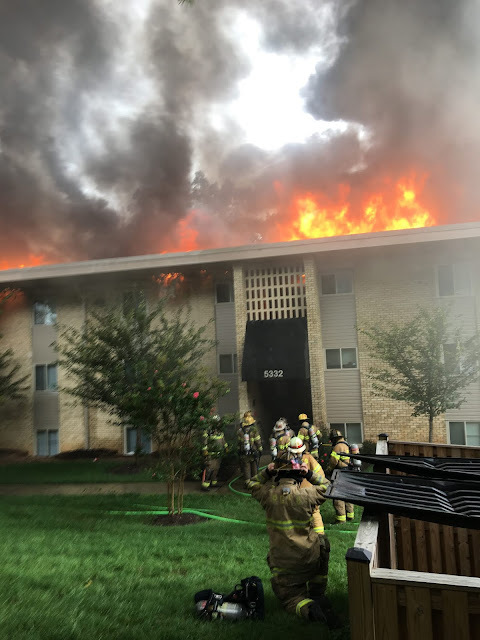 On September 17, 2018, just before 3:30 pm Prince George’s County Firefighters responded to a fire at 5334 85th Avenue and arrived to find a working fire in a 3-story garden style apartment building. The fire was extinguished after a nearly 2-hour firefight. The fire damaged 4 apartment buildings causing an estimated $2.2 million in damages and displaced about 130 residents. Fortunately, no civilian or firefighter injuries were reported on the day of the fire. Fire Investigators identified a suspect and with the assistance of law enforcement arrested her on Thursday, October 4th. Natasha Ciara Joyner, 32 years-of-age from New Carrollton has been charged with several crimes after setting the fire because she was allegedly upset with an ex-boyfriend. Joyner was transported to the Department of Corrections in Upper Marlboro. Image of Joyner is not available.